The YouTube cover star is finally back with a peek at his upcoming Insomniac Season project. Best known for his YouTube covers of Frank Ocean, The Weeknd, and Drake, California singer Sid Sriram finally breaks more than a year's silence with his new visual for "Moments of Weakness," a song off his upcoming Insomniac Season project. While Sid Sriram is most impressive when seamlessly blending smooth R&B vocals with classic Indian singing techniques (like in this James Blake cover), "Moments of Weakness" is a straight-forward and uplifting soul ballad. The video starts out with stunning, expansive birds-eye shots of L.A., but shrinks down to focus on Sriram singing in the twisting halls of an abandoned building. Grainy images of what can be assumed to be his younger self singing fade in occasionally, emphasizing the transition that Sriram has made in terms of his artistry. We don't know what Sriram is attempting to find in the corridors of the decrepit structure; perhaps he's trying to explore himself. 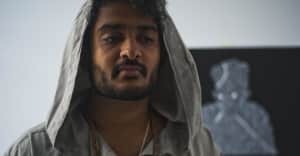 "I started writing 'Moments of Weakness' back in February 2014," Sriram told The FADER over email. "DJ Khalil and I started working on my project, Insomniac Season in March 2014, and this is the song we started with. Both the song and visual have gone through various stages of evolution. Working on this piece was my way of coming to terms with getting older, transitioning. The song explores the emotions that come with precious moments turning into memories. I haven’t released music in over a year. Seeing that 'Moments of Weakness' has truly grown with me from the beginning of this process, it felt like the perfect piece to re-introduce myself with. Look forward to more music to close out this year, and Insomniac Season in early 2016. "